Violence shapes gender relations in multiple ways. Killings carried out in the name of honor are one of the most visible and lethal forms of gender based violence. In its less visible, more subtle forms, gender-based violence threatens the physical and emotional integrity of millions of women living in Turkey, and billions globally. Domestic violence especially that carried out by husbands comprises a “constitutive dimension” of women’s life. We, the people of the Republic of Turkey feel proud of our glorious history. 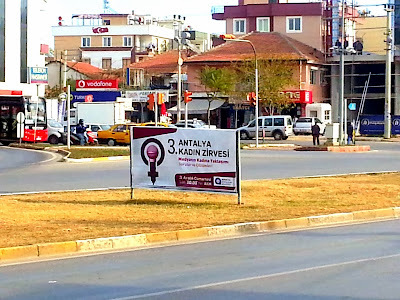 We say that Turkish women are granted the right to vote since 1934. In addition to this, in 1926, the new Turkish civil code passed. 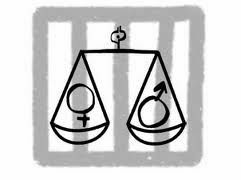 Under the new code, women gained equality with men in such matters as inheritance and divorce. Moreover, in 1935, 18 women deputies had chairs in the Turkish Grand National Assembly. As a percentage, they accounted for 4.5% of all the seats in the Assembly, one of the highest proportions in the world at that time. Despite some advancements made by women in today’s society they are still affected by some challenges. Turkey is an interesting example, from the aspect of the position of women, because it is a country which is influenced by all the contradictions of globalization and traditions. For this purpose, the 3rd Women's Summit will be held on Saturday, December 21 in AKM. Women from different walks of life will participate the Summit as a speaker. Women Friendly City in Antalya Why Increasing Violence Against Women in Turkey? What should be done? 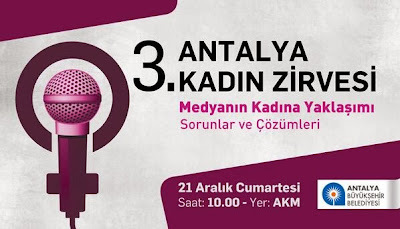 "Questions in order to seek solutions to the Antalya Women's Summit held last year by the Department of Press and Public Relations of Antalya Metropolitan Municipality. Writers, intellectuals, politicians, and at the end of the summit, with the participation of scientists published the manifesto of results on the solutions to stop violence against women and women's demands were identified. 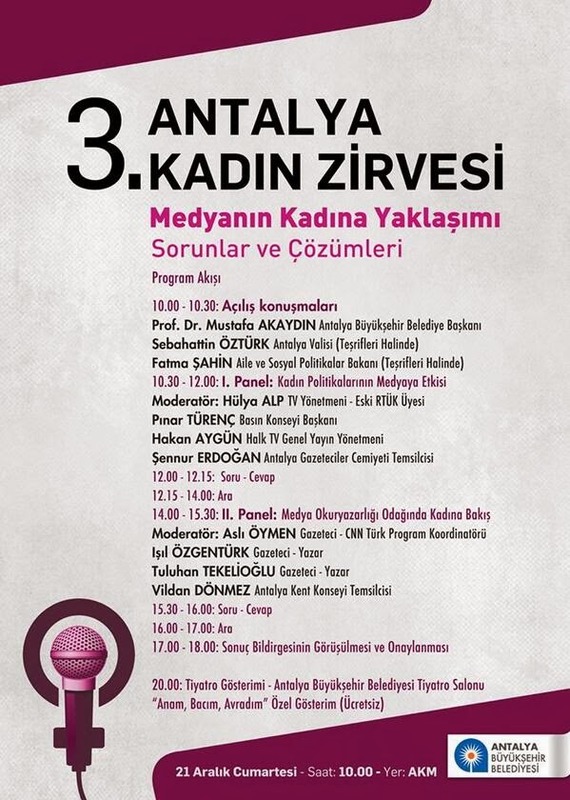 For advocating gender equality in society the 3rd Antalya Women's Summit will be held on Saturday, December 21 at 10:00 a.m. in the Antalya Cultural Center (AKM) Aspendos Hall. At the end of the summit, common accord "Final Declaration" will be created and it will be the collective voice of women. In the summit Family and Social Policy Minister Fatma Şahin and Antalya Governor Sebahattin Ozturk are expected to attend. Summit among the speakers Pinar TURENC (Press Council Chairman), Isil Özgentürk (Republic Newspaper Columnist), Asli Öymen (CNN Turk Program Coordinator), Tuluhan Tekelioğlu (Journalist, Author), Hülya Alp (TV director-old Supreme Board members) and Hakan Aygun (Chief Public TV) include famous names such as the media world. Problems and Solutions What's Happening? 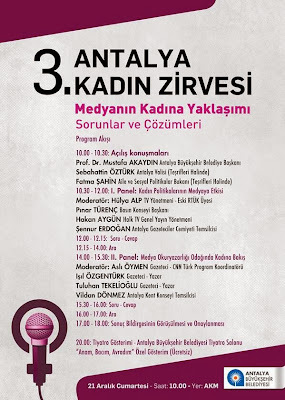 10:30 to 12:00 1st PANEL "Women's Political Impact of Media"
14:00 to 15:30 2nd PANEL "Look at Women in Focus Media Literacy"